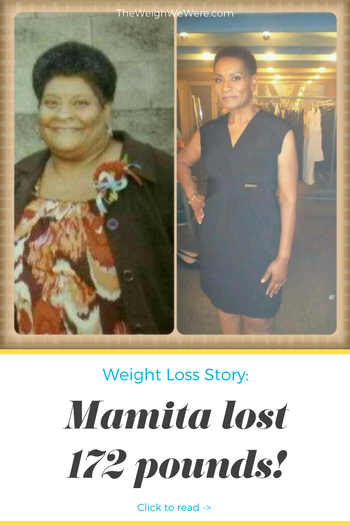 How I Lost Weight: Marnita Loses An Amazing 172 Pounds Over The Age Of 50! I was probably in my 30’s. I simply got too comfortable. I would go to work, come home and do a lot of sitting. Taking care of a family and thinking less about myself and my needs was the norm. We ate on the run a lot due to my daughters after-school activities. Sitting at the kitchen table for family dinner was not the norm. 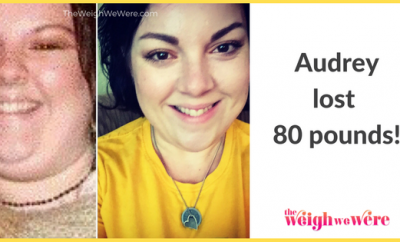 I was tired when I would come in and would do a lot of sitting on the sofa watching television and going to bed on late night pizzas or fast food. I didn’t have a lot of energy for much, other than the things I absolutely had to do. I sat behind the desk all of my career life, therefore, that didn’t help much either. Because it made it convenient for me not to do much moving. When we took family trips, I was very limited because I suffered with severe back and knee pain. I can remember once going Christmas shopping for my grandsons. I was in so much pain it took everything in me to not just walk out of the store. I would often give gift cards and use the excuse that I figured that’s what people want. But in reality I just didn’t have the energy to get out and do a lot of shopping. I can also remember once going out with my youngest daughter, Angela, to look for a Homecoming dress. To this day, she has no idea how much pain I was in looking for her dress. Sometimes I would scream out to God and ask Him, “Why”. 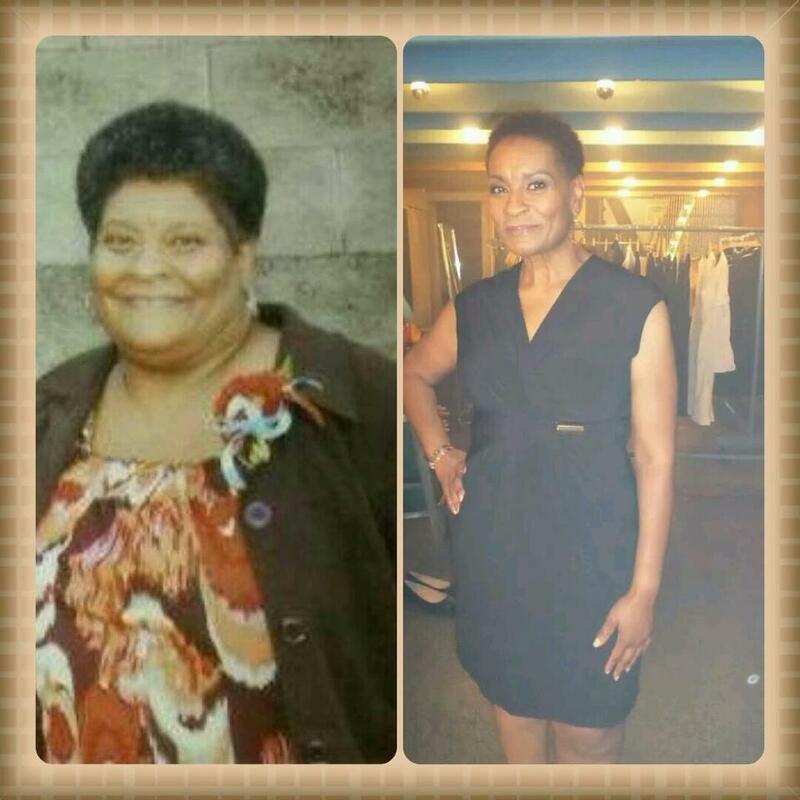 There were a couple of turning points for me, the first was when I was crying to my daughter, Courtney, about my weight and she replied, “M if you’re tired of being over weight, do something about it, I want you around to see your grandchildren grow up”. The final straw was when I went in for a work physical and was informed that I had high blood pressure. My numbers were triple digits– both top and bottom. They wanted to hospitalize me right then and there, but I refused. 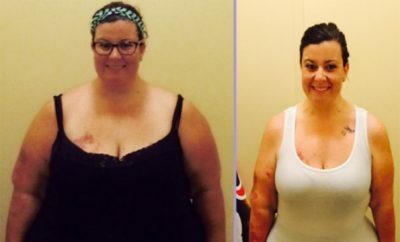 I asked what Plan B was because I didn’t have time to be in the hospital ( I run my own business).So they put me on a couple medications and told me I needed to lose weight. I said done and that’s what I did. I haven’t looked back since, that was over four years ago. I drastically cut my caloric intake, stop drinking pop completely and drank water instead. Over time, I gave up red meats and pork, I don’t drink anything but water, green tea with lemon, decaf with lite cream, and Almond Milk in protein drinks or smoothies. I use Almond Breeze (30 calorie) I don’t buy sugars of any kind, flour, cornmeal, oil (other than Virgin Olive oil) butter. I only use fresh herbs for seasoning my food. I incorporated exercise about 2 1/2 years ago. I exercise between 5-6 times per week. I do a variety of things. I started off by using an old stationary bike that had been sitting in my basement for years collecting dust. I used it for about a year, and burned it out. I upgraded to a Nordic Track bike and elliptical. Eventually, I started adding hand weights, jump roping, walking, and recently, I purchased a Beach Bike, it’s pretty cool. I hadn’t ridden a bike in over 30 years. I can climb, jump, run with my six grandsons now. We take nice long walks, go to the playground. They even workout with me sometimes. It was pretty quickly, however, I intentionally wanted to lose weight slowly because I wanted to get use to the idea of eating clean. I just felt if I tried to do everything all at once, it wouldn’t last very long. What I have discovered, is that I enjoy eating healthy. I have no issue eating a veggie burger versus a hamburger, or Humus and carrots versus a bag of potato chips. 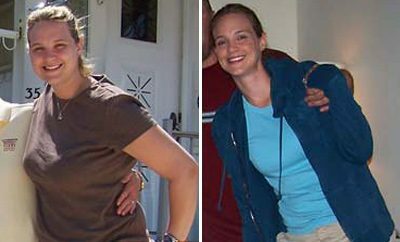 I never joined a gym or a weight loss program, or a personal trainer, I did it all on my own. I lost the first 75 over the first year, and the remaining 100 over the past 3 1/2 years. I haven’t really loss much in the past year. I believe I’ve hit a plateau and I do cheat more frequently than I did when I first started, but I have always got back on track pretty quick. The most I’ve ever regained at any given time is about ten pounds. Currently, my weight fluctuates between 160-165 pounds. My biggest challenge in the beginning was my husband wasn’t very supportive. He thought he was being supportive because he would do things like buy me gadgets to aid in my weight loss. Which I really appreciated it, but then he would turn around and bring cakes, cookies, ice cream or anything that I used to enjoy, home. I would ask him not to bring those things home because I wasn’t strong enough to resist them. It took awhile, but he is doing much better about respecting my choice to eat healthier. As a matter of fact, it has helped him too. I do all the cooking and grocery shopping. Although, I sometimes don’t care to exercise, but honestly, afterwards I always feel better. Being pre-menopausal, exercise helps with some of the side effects. Yes, many times I wanted to give up! There is NOTHING easy about trying to lose weight but I believe what keeps me going is the fact that I feel so much better, I look better in my clothes, and I am inspiring others. And if I give up it may not only affect me but so many other people who have shared with me, that I am their inspiration to get fit and healthier. Yes, I am going through a weight loss plateau now. I just can’t seem to get under 160 lbs. But I plan on using more weights and I do a lot more walking. I have a Fitbit and I absolutely love it! Yes,a number of them. I would purchase something that was a size too small to see how long it would take for me to get into it. I remember once going to Victoria Secret to purchase a new bra with a gift card given to me by my daughter, from my little grandson. I waited almost a year to use it. But the sales clerk came back to take my bust measurements. I was sharing with her that I used to be a 40DD. She was so amazed until she ran out the dressing room to tell her supervisor that there was a lady in the dressing room who had gone from a 40DD to a 36C. Wow, talk about feeling pretty good about my accomplishments! First of all, I eat at least three meals per day, compared to before when I would skip breakfast and maybe lunch, and fill up on junk and processed foods like pizza and burgers late at night.I eat very clean now. Lots of fresh fruits and vegetables, yogurt, protein shakes, fish, turkey and some chicken. I bake, grill or use a Wok to prepare my foods rather than breading and frying. I don’t drink juice, milkshakes, pop, lemonade, etc. I try to avoid sweets but I do still eat them from time-to-time. I will eat Dark chocolate (62-90 Cacao) in place of Milk chocolate when I have the urge for chocolate. Vigorous physical exercise is probably my biggest change compared to little to no activity before. I am most proud of this. I have so much energy, until one day during a visit, my daughter Ashley said, “Mom did you just run up those stairs”? I replied, “Yes”. Go slow. This is a journey not a race, which means you will have the rest of your life. Don’t try to complete all of your goals at once. 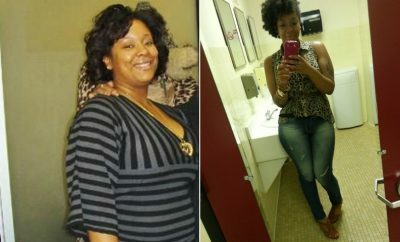 I purposely loss the weight slowly. I wanted to get used to the idea. I wanted to enjoy every moment. Tricks- I have a lot of self-talks with myself. I tell myself that I CAN do this! That I am “More than A Conquer Through Jesus Christ”. That this is my Life I cannot afford to play with it! When I eat something I shouldn’t have I immediately get up and take a walk. I can remember one time walking the parking lot of Walmart late at night just to get it in. My husband often tells me that I’m my biggest critic. I learned that that’s not an insult, but more like a compliment. I hold myself accountable every day. Sort of like a recovering alcoholic or drug addicted person, you can’t go the place you used to go or sometimes even associate with the same people. I refuse to let anyone stand in the way of my new lifestyle. I will pack my lunch every day for work, and I also do when going to family gatherings. We have a Family Reunion coming up in July, I have already talked to the host about me packing my own meal. You do what you have to do to WIN!!! My advice to anyone who inspires to lose weight and get healthier is once you make up your mind to do it, start with a plan, execute it, and follow through with it. Yes, there will be bad days, slip ups, mess ups, but the most important thing is to never give up. I have a little saying that I tell my Facebook weight loss support group (“Beat the Bulge Let’s Get Healthy Support Group”) “Fall Seven Times Get Back Up Eight”. The word of God tells us, “That the race is not to the swift, but to the one who endures to the end”.